In the fifth, Ryan Lavarnway and Bryce Brentz hit back-to-back home runs to lead off the inning, providing Pawtucket with a 5-0 lead. Brock Holt went 3 for 3, and Jackie Bradley Jr. was 2 for 4 from the top of the order to lead the PawSox offense. With the victory, Pawtucket finds itself a game ahead of Buffalo (TOR) for first place in the International League's North division. Portland had a quiet day Sunday, as the Sea Dogs were shut out by the Binghamton Mets (NYM), 5-0. Charlie Haeger received the loss, pitching seven innings and allowing five runs (four earned) on eight hits and three walks, while striking out two. Brock Huntzinger tossed a flawless inning of relief. The Sea Dogs managed just four hits and struck out 12 times against a formidable group of Mets pitchers. The Mets scored their first two runs off wild pitches by Haeger. The kunckleballer had three total on the day, leaving him with eight wild pitches this season. Salem could not find a way to hold back the Fredrick Keys (BAL), falling 8-1. Henry Owens received the loss, hurling 4 2/3 innings and allowing four runs on five hits with four walks and six strikeouts. Matty Ott also had difficulty containing the Keys offense, surrendering four runs on five hits and a walk in two innings of relief. Down 4-0 in the fifth, the Red Sox scored their lone run of the contest on a Blake Swihart RBI double. Henry Ramos had two outfield assists in the game, gunning down a runner at home and doubling a runner off of first base. Greenville's valiant effort was not enough, as the Drive fell to the Charleston RiverDogs (NYY), 5-4. Francellis Montas picked up the loss, tossing four innings, while allowing four runs (three earned) on four hits and four walks. The Drive took a 1-0 lead in the second, as Keaton Briscoe laced an RBI single. Charleston would tie the game in the bottom half of the inning and take a 2-1 lead after bringing home a run in the third. A Jordan Weems RBI single in the fourth plated two runs and gave Greenville a temporary 3-2 advantage. The RiverDogs would also score twice in the fourth, giving them a 4-3 lead. Charleston plated an insurance run in the seventh and moved to the ninth with a two-run lead. In the final frame, a botched double play and a wild pitch allowed the Drive to pull within one. Greenville loaded the bases with no outs but failed to score any additional runs. Greenville's problems with runners in scoring position were a trend for the game, as the Drive went just 3 for 13. The team also combined to strike out 14 times, including two with the bases loaded in the ninth. Player of the Day: Chris Hernandez, who picked up his third victory of the season in Pawtucket's 5-0 win over Louisville. Hernandez tossed 6 2/3 shutout innings, helping to lower his ERA to 3.58. 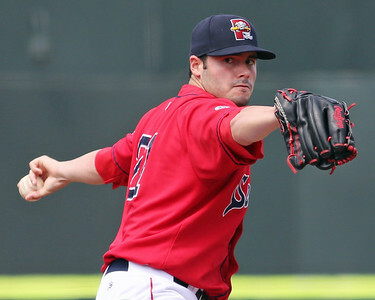 The 24-year-old left-hander has been strong pitching away from McCoy Stadium, going 3-1 with a 2.43 ERA in six games (four starts) on the road.